Does the HTC One (M8) Harman Kardon edition really sound that much better than the original? The HTC One (M8) is a great phone. In fact, we recently called it the best Android phone in the world. While the design is the most obvious plus for the M8, HTC’s new and improved front-facing BoomSound speakers mark another area where HTC’s flagship phone shames rival handsets. As good as BoomSound is on the M8, however, Sprint’s special Harman Kardon edition promises sound that is somehow even better. Does it deliver? Sprint sent us one a couple of weeks ago so we could find out for ourselves. Here’s the short answer: Yes, the sound on Sprint’s HTC One (M8) Harman Kardon edition is better than the sound on the standard version of the phone. Sprint’s tweaked M8 features sound that has been tuned by the audio experts at Harman Kardon, who certainly has a reputation that precedes them. This special version features the same amplified speakers and BoomSound cavities as the standard model, but the sound is much fuller and the clarity is improved. Even better, Sprint’s Harman Kardon edition M8 ships with a set of Harman Kardon AE-S earbuds at no additional cost. These bass-heavy buds deliver sound like no other headphones we have ever seen ship with a smartphone. Combined with HK’s tuning, this smartphone is an audiophile’s dream. The AE earbuds normally retail separately for about $80. Sadly, there is a trade-off with this special version of the HTC One (M8): Unless you’re a fan of black and gold, the look of this phone is a little jarring. 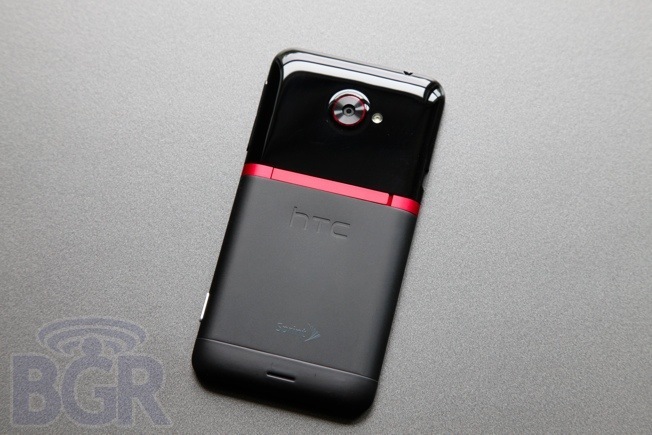 HTC and Sprint have a history of making very poor design decisions when they get together. The worst by a landslide was the EVO 4G, but depending on your taste, the M8 Harman Kardon edition could be a close second. The back is dark black aluminum with a brushed finish that attracts fingerprints like nobody’s business. Then, the metal inserts on the front are bright gold. Sadly, I wasn’t quite able to capture just how gold they are in the images here. Some people might be into the look, and for them, the HTC One (M8) Harman Kardon edition smartphone is a fantastic option. If you left your love of black and gold back in the 1980s though, this phone is a tough pill to swallow.